I’m generally a sap. I get misty when I see someone cry in a movie (or real life). I re-post those inspirational quotes and heart-warming videos you remember for maybe 5 seconds after reading them. So when Octavia Spencer walked towards the stage of the Kodak Theater as the 84th Academy Award winner for Best Supporting Actress, about to clasp her hands around that iconic gold statue, I held my breath waiting to hear her speak, ready to be moved. Then it happened: the standing ovation. While other actresses have received standing ovations, the length of this one seemed a wordless acknowledgment of the power of this historic event, when another African-American woman became a lifelong member of Team Oscar. And if that didn’t drive home the impact of Octavia’s win, her tears surely did. And that’s when I started feeling conflicted. In that one pregnant moment, it was impossible not to sense the years of perseverance and hope that every actor musters just to have a career, let alone industry acclaim, made even more daunting when that actor is a person of color. Her raw emotion stirred a hyper-awareness of the road behind her and all those who helped pave it. Oscar night is the single most comprehensive assembly of power players in Hollywood. Much like a State of the Union Address for the film industry. (This might explain why Woody Allen was a no-show–they’d need someone to take over in case there’s an attack on the theater. Or all the Spanx spontaneously combusted. Or both.) Everyone clapping, beaming, affirming their appreciation that a person of color finally made it to the big league…through a gauntlet of their own creation. It was as if the elephant in the room–the pervasive and persistent low diversity in the film industry that made Octavia’s success such a remarkable win–was somehow not directly connected to the practices and choices of many, if not most, folks in that room, whether consciously or unconsciously. These are people who make and break careers. By applauding a person who’s overcome the challenges, these power players were essentially placing the problem outside themselves, as if the legacy of racism still somehow just happens–rather than being perpetuated by these very same Tinseltown stakeholders–and people of color manage to make progress anyway. So that Billy Crystal can perform in blackface–hilarious, in 1927!–and several hours later, the audience nobly gives a standing ovation to a woman of color for winning an award. Within the ranks of the Academy’s nearly 6,000 voting members, an overwhelming majority are white, middle-aged males, as this Los Angeles Times article recently revealed. Just last year, not one American actor or actress of color was even nominated for an Oscar. Considering it’s been more than a decade since Halle Berry became the first and to date only African-American woman to receive a Best Actress nod, it seems especially tragic that people of color aren’t represented in increasing numbers on the list of nominees. While Hollywood may be willing to tell stories about racism in the Jim Crow South (The Help) or South Africa (Invictus), the story of racism within the film industry still doesn’t get the green light. 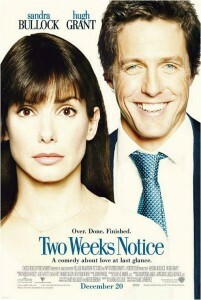 Poster for 2002's "Two Weeks Notice"
Typically, Hollywood film roles played by people of color are those written specifically for their race or a race that could be perceived as looking similar (an Italian-American playing a Latino, for example). In 2009’s Academy Award competition, the African-American nominees–brilliant artists, all–played roles specifically written for black actors. The Help’s Minny in 1950s Mississippi clearly wasn’t written for Sandra Bullock. Makes sense. But what about other roles that don’t refer to a specific historical period or an actual person? Do we think the makers of the 2002’s rom-com Two Weeks’ Notice ever considered casting Halle Berry, the previous year’s Oscar winner, for the Sandra Bullock lead character? Chances are, only if an earlier draft of the script specifically called for an interracial couple. And, in that case, the storyline would have centered on this fact as in 2005’s Guess Who, a remake of 1967’s classic Guess Who’s Coming to Dinner. In the 45 years since Loving v. Virginia, movie audiences could be forgiven for thinking interracial relationships were still illegal, given the scarcity of examples on movie and TV screens. How would The Kids Are All Right have been received if Annette Bening’s character was cast with Angela Bassett? Would studio execs have deemed it too “edgy” for a film to have a leading character who’s a lesbian and happened to be played by a black woman? I’m not suggesting these artists are interchangeable, that each actress doesn’t bring her own unique talents to bear on a role. I’m asking that we consider the ways Hollywood’s choices imply that an actor’s or actress’ race might change or limit their ability to play any character. And the truth is, this likely reflects a reality in modern American culture: that many of us still find interracial relationships surprising, and that we tend to socialize with those of a similar racial or ethnic background. But if movies don’t represent a world in which people fee free to make choices beyond the racial divide, it can become that much more difficult for us to feel normal about choices we make in our private lives that may not fit in with the dominant culture. Historical films about race relations tend to be benign, almost abstract illustrations of the ugly reality of racism. Also, by focusing on racism in the past–often highlighting some easy-to-hate person or regime, like South Africa’s system of apartheid–these stories imply it’s no longer really an issue. The audience is quick to feel a sense of righteous indignation because the films are told through the lens of hindsight. They’re almost fairy tales, where viewers can root for the heroes and heroines, feeling uplifted when the oppressed folks stand up for themselves in the face of their oppression. All of which plays into that keystone of the American Dream, the by-your-bootstraps myth that has us believe that, despite a system that historically has been tailored for straight, white men, if you have the right amount of chutzpah, you can still achieve your dreams. As if chutzpah were somehow a substitute for equitable social policies and practices. What these stories fail to target is the larger culture that makes this bootstrap myth necessary, that has kept such a rigged system firmly in place so that white men in Hollywood are still deciding which stories get told and celebrated with awards. Films seeking to challenge viewers’ own unconscious prejudices or the ways many of us still benefit from a system in which all have not had equal access to resources? Not quite the warm and fuzzy family viewing that makes for blockbuster opening weekends. Which brings me back to feeling conflicted while Octavia was all verklempt with little Oscar in her hands as row after row of swanky, Spanxy Hollywood elite stood and applauded in her honor. It’s admirable and beautiful when someone can beat the odds, much like the uplifting stories of racism’s ugly history. Indeed, I came to realize that I may have held my breath in hopeful anticipation of an inspiring speech about the ways she just kept charging forward, or the people who saw her talent and chose to pay it forward, like Steven Spielberg. An underdog triumph. Just like in the movies. And while I was indeed moved by her emotional speech, while I understood the importance of acknowledging when someone’s done the extraordinary, it doesn’t compensate for the fact that in 2012, over 70 years since Hattie McDaniel became the first African-American to win an Oscar, it’s still an underdog story.